A Maplesoft simulation and modelling platform was used to build the robotic arm of a simulated brain, said to be the world’s largest functional model of the human brain. A group of neuroscientists and software engineers at the University of Waterloo’s Computational Neuroscience Research Group (CNRG) built the simulated brain, Spaun, which has a digital eye for visual input, and a robotic arm to draw its responses. The robotic arm, the output system, is the only motor control system of the model and has been created using Maplesoft’s simulation and modelling platform, MapleSim. Travis DeWolf, the University of Waterloo researcher who built the arm, attributes the success of the complex arm model to MapleSim’s symbolic computation power and model simplification capabilities. Spaun (Semantic Pointer Architecture Unified Network) consists of 2.5 million simulated neurons, allowing it to perform eight different tasks. Spaun has a 28x28 (784-pixel) digital eye, and a robotic arm that can write on paper. 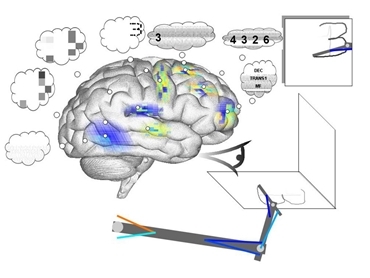 The researchers show it a group of numbers and letters, which Spaun reads into memory, and then another letter or symbol acts as the command, telling Spaun what function to perform. The output of the task is then inscribed by the simulated arm. Using the arm, the brain demonstrates tasks such as copy drawing, counting, memorising and reproducing sequences, and fluid reasoning. Using MapleSim, Travis and the team constructed a 9-muscle, 3-link (shoulder, elbow and wrist) arm model, based on the model presented in a paper by Dr Kenji Tahara. The muscles in the arm were constructed in MapleSim based on the Hill muscle model. The controller was modelled in MATLAB, and MapleSim’s connectivity to MATLAB via the Maple engine provided seamless integration between the two systems. Travis explains that they were able to gradually, and very smoothly, increase the complexity of the model using MapleSim, which allowed them to easily add in another muscle/link as they progressed without losing any fidelity. Travis chose MapleSim over other similar modelling and simulation tools for its symbolic computation capabilities. With MapleSim, Travis had access to the symbolic equations driving the system, which meant he could get very accurate descriptions and do extensive analysis of the model. The research goal for Spaun was to evaluate how different scenarios affected the output of the brain system. Other research studies using the same MapleSim arm model have examined modelling the effects of damage to the brain, caused by blunt trauma, Huntington's disease, and cerebellar abnormalities. The results were compared to real-life patient data to evaluate the accuracy of the model. Having a realistic arm that behaves similarly to an actual arm, with appropriate muscle responses and arm segment lengths and mass, is important to getting accurate results. Results from this research can be applied to modelling new patient treatments. For example, the effects of deep brain stimulation for treating Parkinson's disease by inserting a wire through the brain to send electricity can be modelled in this manner. Neuroprosthetics is another application area where better understanding of motor control systems and outgoing signals will lead to better functioning prosthetics. Travis is currently working on a learning based model of the motor control system of the brain system with MapleSim playing an important role in the research.